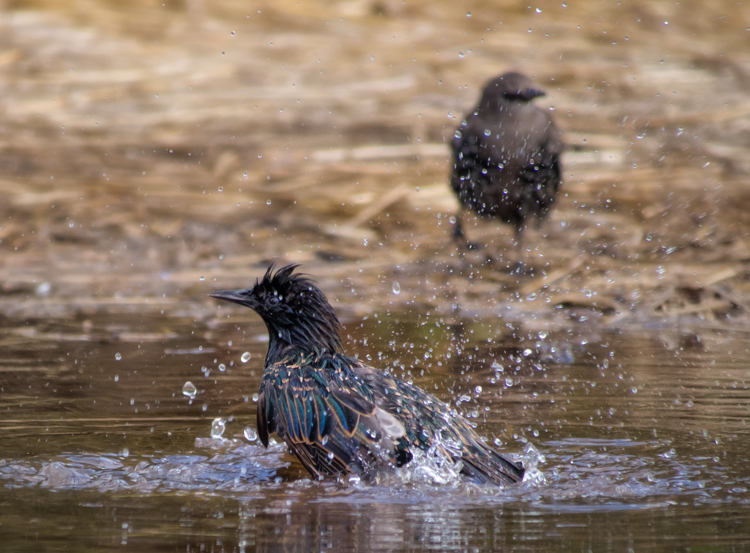 “Starlings are related to Mynahs, both in the family Sturnidae. They’re exceptional mimics. In a 2007 piece in the New York Times, Jonathan Rosen mentions Mozart’s pet starling who could ‘sing a few bars of his piano concerto in G major.’ Another New York Times piece cites a study done with starlings where they were able to recognize sophisticated language patterns, a capability previously not recognized by scientists. For me, those elements cast reasonable doubt on the overarching criminal guilt of starlings. I understand the complexity of their ecological interaction, but I don’t condemn them, particularly in the face of greater environmental sins by humans. Starlings are common residents in my city landscape. In appearance they are kaleidoscopic, polychromatic, iridescent, resplendent. In song, they are whistles, chants, murmurs and twitters. Every spring, they find ways to reconfigure urban structures into sanctuaries for their nests — structures like this corrugated metal framework. They comb the nearby grasses and low tides for grubs, beetles, marine worms, and mollusks to nourish their nestlings with a high protein mix. 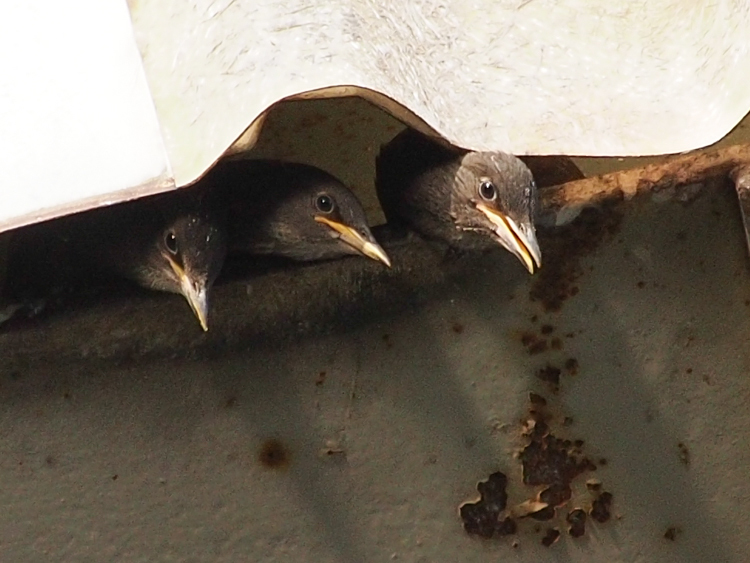 Last year, as fledging time drew near, I’d zoom in and see these faces reaching for a parent’s familiar beak. The parent birds brought meal after meal in short succession, as do all good avian parents. They’d hover within reach of their nestlings and deliver the goods. A few days ago, I stopped by this location and snapped a few more images. 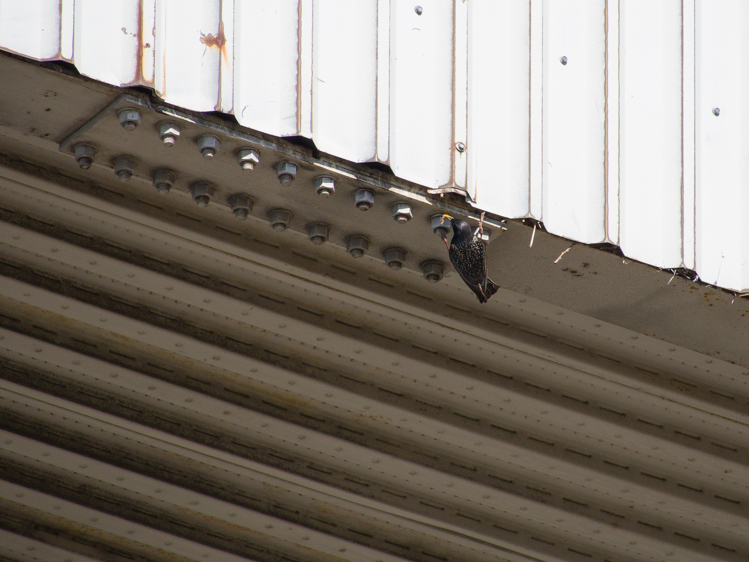 When I looked more closely at home, I noticed that the parent starling in one of the photographs adopted a clever means of clinging to the bolts and nesting twigs as a way to stabilize herself for entry into the nest. Be sure to click on the full-sized image to take a look at the footwork. 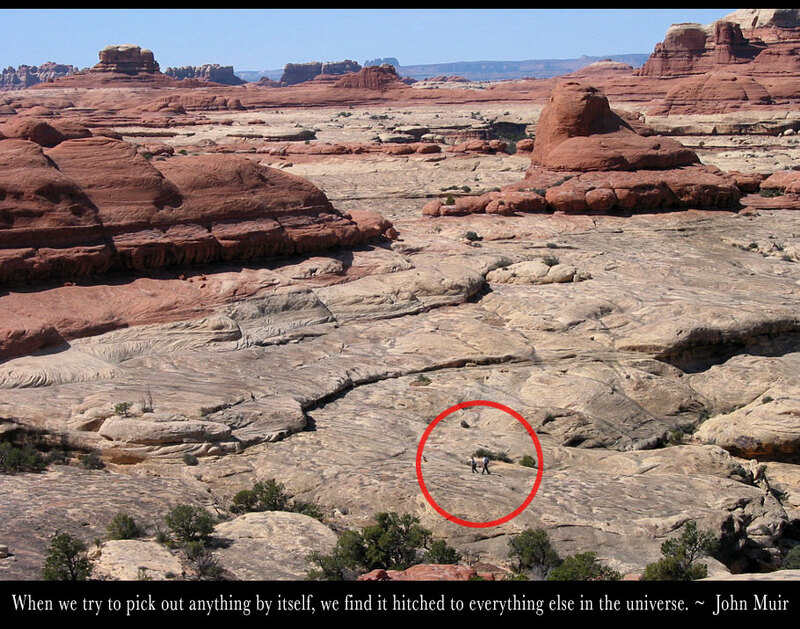 Click once to enlarge, then one more time to expand full size. This year’s group hasn’t fledged yet — but last year, they emerged from their cubbies with such exuberance, we named them the Class of 2012. 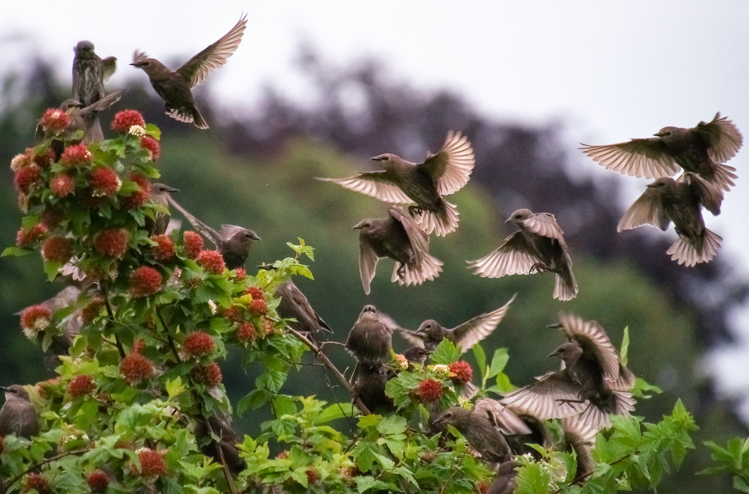 They were the excited youngsters of both starlings and crows who got their spring wings and understanding of freedom. Later in the season, I came upon a flock in the same area — adults and juveniles, transitional plumage emerging, all sharing a few big puddles after a September deluge. 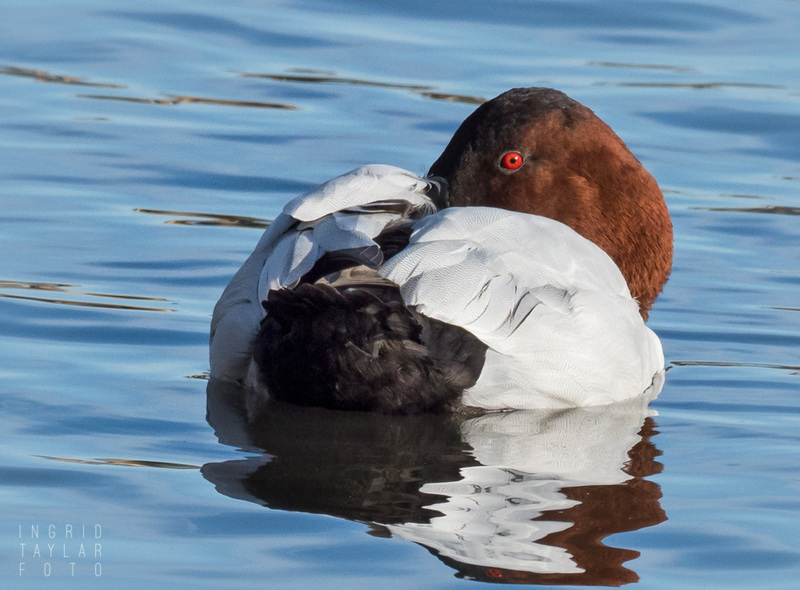 At this phase of feathering, youngsters acquire their spots and adults move away from their sleek breeding plumage toward their own spots, which will characterize their non-breeding months. I’m looking forward to the Class of 2013. There are fewer nests this year. I wonder if some of them were destroyed. People do all manner of things to Starlings and their nests because they can — the birds have no legal protection. 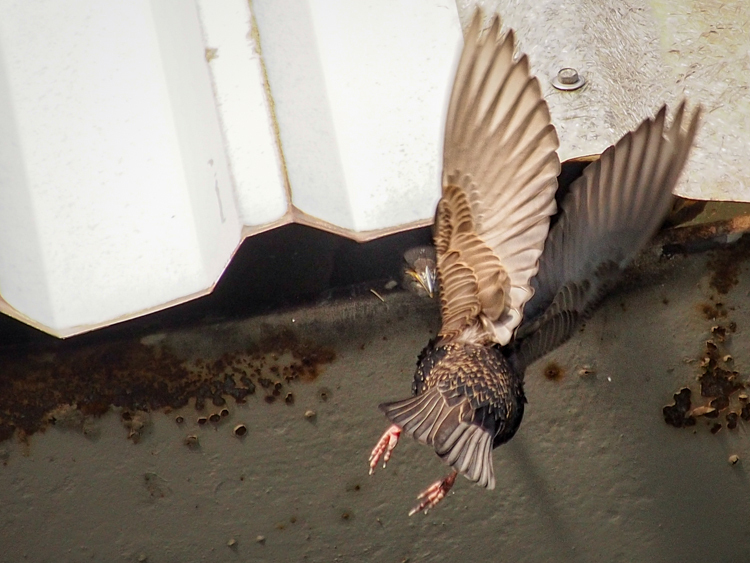 This month and next will show the outcome of the Starling parents’ toil, and I hope to be photographing a few flyovers once the new babies get their own wings. And you know what I shoot with? I shoot with a Canon Rebel, a “prosumer” camera. I got a Canon 60D in an effort to get an advanced model, and I had to get another Rebel because the 60D is just too heavy (it also broke down). I personally think the future is in ergonomics; this is why now Canon and Nikon are struggling with a functional four-thirds design (that will work with their optics). They are now lagging behind, and recently Canon tried to streamline its full frame model, the 6D, to no avail! It’s still heavier than the 60D or a Rebel. 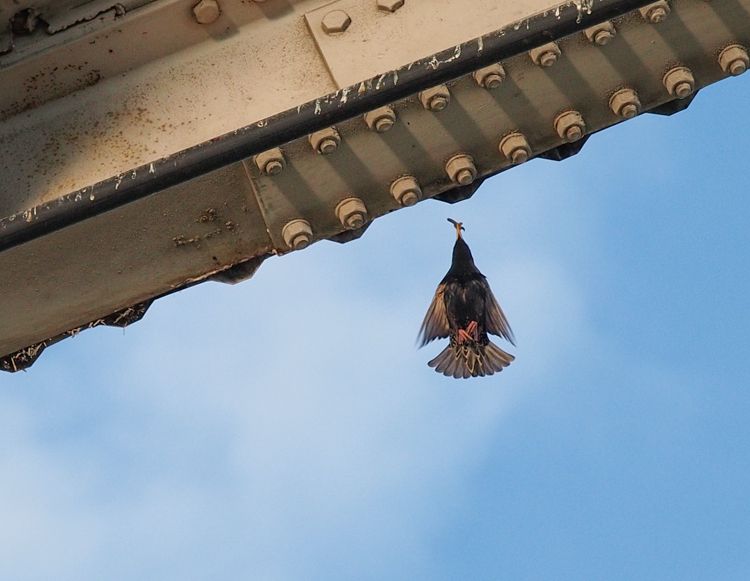 I love the Starling’s iridescent plumage and how close you got on the first shot. I too have to fight with convincing Puerto Ricans the Green Iguana is not eating Coquies, or endemic bird’s eggs. Just today I had to interrupt a group leader (who was a school teacher by the way) because he was telling the children how the Iguana was eating Coquies and other animals. It was very disheartening to hear an uninformed school teacher referring to the Iguana as an “invasive” species and a “trash” animal. Iguanas are benign in Puerto Rico, and are herbivore reptiles. They do not threaten any endemic species whatsoever. Maria, I remember your posts about the Green Iguana and its vilification as a species, especially the piece about their establishment through the illegal pet trade. Isn’t that how it always is? As one example, we have issues with feral hogs, some of which (Eurasian wild boar) were brought here for sport hunting. That there is so much legal leeway in ownership of exotic pets or game farm animals — and then dramatic and often cruel retribution against the animals themselves — speaks to such an imbalanced and misguided ethic. 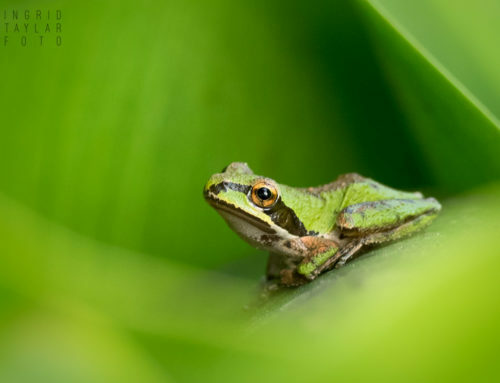 That’s not to say that some invasive plants or animals don’t cause considerable damage when transported to environments where they easily exploit other species. But you could say I’ve grown weary of other species bearing the burden for our often short-sighted choices and policies. 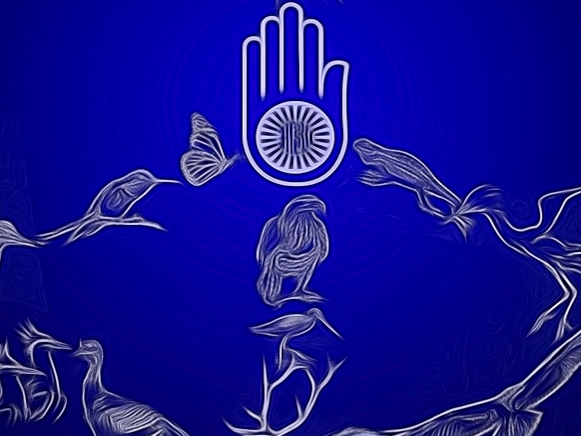 As for invasive or trash or nasty species, well, such fears are irrational because they have no basis in truth. Our Creator made everything “very good.” And that’s that. Case closed. Ingrid is such an accomplished photographer. Look at her gallery. I am envious. I’ve had to carry so much bulk of camera equipment and look at all that she does. Maria, you are too kind! There are obviously limits on what small pieces of gear can do, but the technology is definitely getting better. For my purposes and mobility, I’m endeavoring to stay as light as possible with the hope that technical improvements will continue to downsize even the best cameras. Oh my goodness, Ingrid! Every time a read one of your posts, it is my FAVORITE ever and this I think is my favoritest favorite of all. Truly- you are so talented in so many ways. Thank you for sharing what you see and know that we can too. Elizabeth, I can return the compliment … and simultaneously thank you for the beautiful work you do on behalf of our feathered peoples! I can’t hate Starlings, I can’t place blame on them for being here when it was man who introduced them. I can’t dislike Cowbirds either since it was human caused deforestation that has aided in their range expansion. 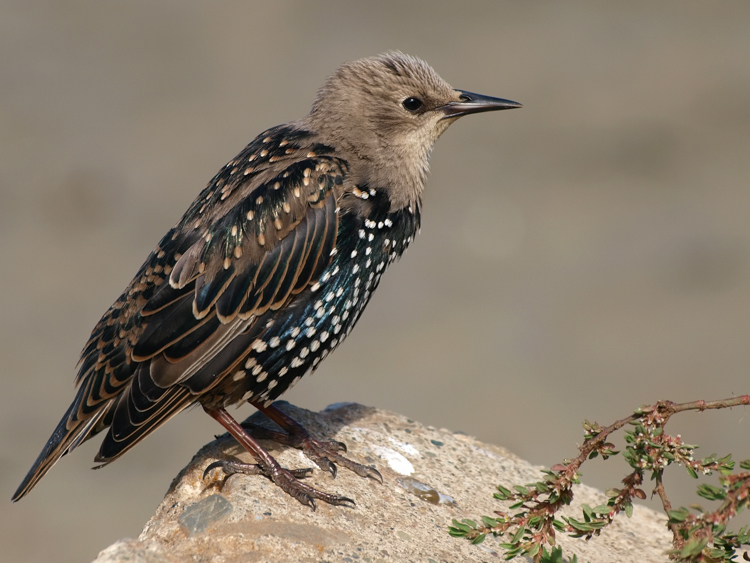 I appreciate the beauty of European Starlings, their songs and tenacity. Mia, you are so right about deforestation. I feel that many still do not understand the concept of “invasive”. “Invasive” species have long been blamed on human mistakes. I really do not believe it is so. I believe there will come a time, as you well say, that deforestation on earth will bring even more of the “invasive” species to different parts of the planet. It is inevitable. They do not and will not depend on humans to be introduced “by mistake” or ‘ignorance”. They have a way of crossing over continents with weather conditions and other climatic phenomena. This is what I feel many still do not understand. The most fittest and adaptable animals such as the Starlings, The Passer domesticus, and the mesopredators such as the green iguana, have survival mechanisms that enable them to endure natural disasters and even use them to their advantage. I think it’s time to stop blaming humans for the introduction of “exotic” species into specific ecosystems. The mass eradication of exotic species is not only anti-ethical, it contributes to the extinction of the exotic species involved as well. When the slaughter of the Burmese Python took place in Florida, nobody thought the Burmese Python was vulnerable in Vietnam due to deforestation and illegal pet trade practices going on there. These exotic animals deserve protection just as endemic species do; they need to be placed in sanctuaries, but not massively eradicated. Is it realistic or even possible to totally eradicate an exotic species? The anger and discontent then escalates when we are faced with the dilemma of who will predominate; the native or the exotic? The “blaming humans” for introduction of exotic species is also a rationalisation of the dilemma. Yes, maybe humans did aggravate the situation by releasing their pet iguanas in Florida. But it doesn’t mean the Iguanas were not going to get there eventually. It just happened sooner with humans. Hummingbirds do one of the longest bird migrations possible. They cross the Gulf of Mexico nonstop to get to Mexico. Starlings did the same thing, even if it was from Europe. People insist that someone in particular released the Starling the U.S.. I don’t believe this. 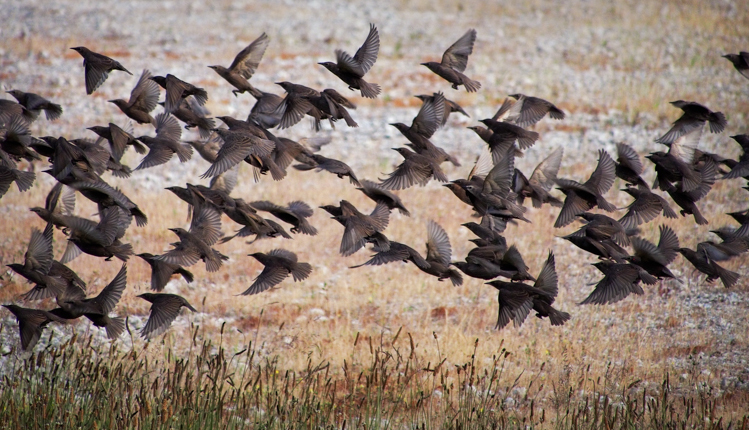 I truly believe the Starlings would have arrived to the U.S. no matter what. Mia, it’s amazing how animals have adapted to our various intrusions … cowbirds included. It does seem as though humans resent species who are equally efficient at adapting to the same circumstances we do. I’ll be honest and admit I’m not a starling fan. I don’t blame them for being here but I wish they weren’t. That said, their indiscriminate slaughter is pointless (and inhumane) and brings out the worst in those who participate in it. Mia keeps working on me to be a little more tolerant of them. Your photos and narrative are another step in that direction. Your “footwork” image is a great example of one reason they’ve been so successful in filling niches when given the opportunity. The biologist in me admires their incredible adaptability so I continue to be torn by all that has happened with them in North America. Ron, I agree with you about indiscriminate slaughter bringing out the worst in people. 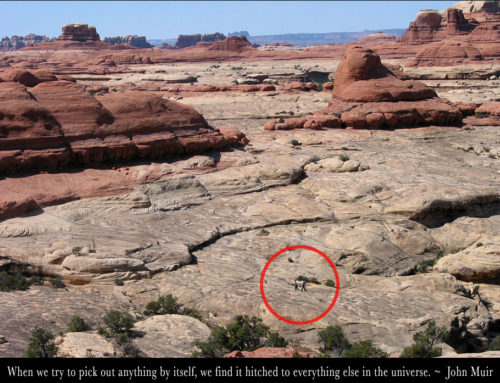 It’s so apparent in the case of non-native species or species like coyotes who have no effective legal protections. What are the effects of Starlings that are most disturbing in your view? Do you think there’s validity in the study cited above or do you consider it just one perspective? 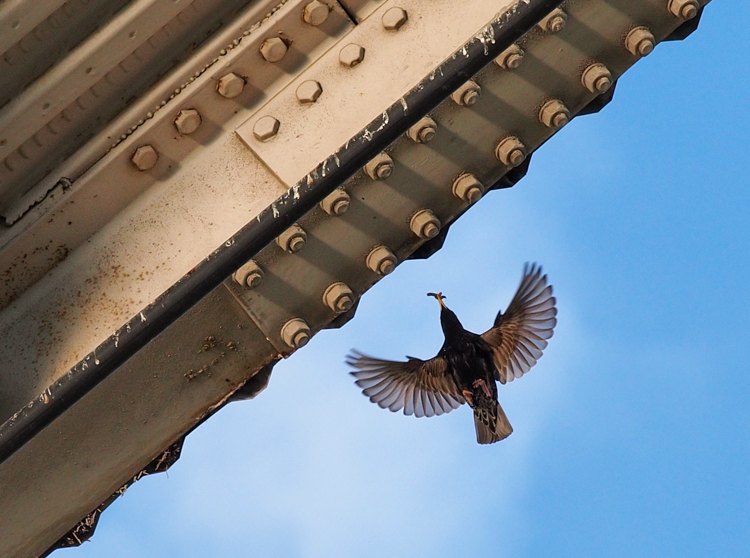 It’s true that in our urban environment, devoid of many other species, Starlings, to me, are a welcome flutter of life. I do recognize how their presence is viewed differently in urban areas or in species-specific environments, like bluebird boxes. The accounts of Eugene Schieffelin’s release vary. What I was meaning to say was that even if Schieffelin wouldn’t had released those flocks; the Starling’s adaptability to climate and humans would have brought them here (to the U.S.) anyway. They’re actually in the Caribbean now too. 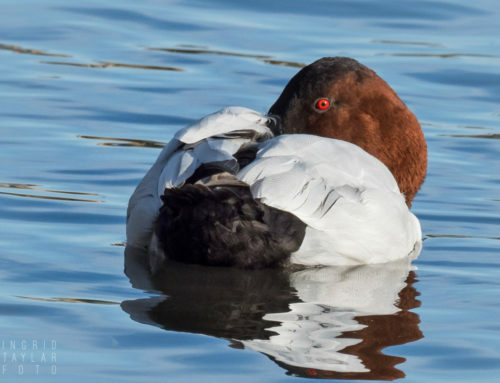 They’re known to have an unpredictable migration pattern, although an established colony is known to migrate from Great Britain to S. Africa, most are natural vagrants; and move as necessity or climatic conditions provoke them. This is from an excerpt written by May Thacher Cooke (in 1928) who was the first woman to hold a serious position at the Bureau of Biological Survey (BBS), which later was to become the U.S. Fish and Wildlife Service. May’s work was published in USDA Circulars and Departmental Bulletins. Read her story here: http://www.aphis.usda.gov/wildlife_damage/nwrc/about/history/may_thacher_cooke.shtml (unfortunately under a “Wildlife Damage Management” USDA heading for the article). I find it impressive that already in 1928 May Thacher Cooke was providing alternate methods to protect both the native bird species and the Starling. I don’t know that by blaming a particular human event (such as Eugene Schieffelin’s release) is the only way for me to understand this clearly. I just question whether humans have any ‘control’ over highly adaptable species and other means of non-human introductions and events. Maria, thanks for those links. It’s so interesting to read the perspective as written in 1928, with her then predictions of how the Starlings would migrate and expand. I agree with you about Cooke’s insightful early observations about protecting native birds. My bottom line with species like Starlings — and it’s a perspective many do not share, I realize — is that if we made serious, consistent and commensurate efforts to curtail our own expansion and damage, it might seem more valid to me how we vilify non-native species. At the same time that we work to control them, our species is at the top of the list when it comes to ecological damage. So there’s a level of hypocrisy that disturbs me whenever new protocols arise, calling for mass extermination. There is no other species that comes close to what we lay upon this earth. We propagate at will, develop and raze habitat at earth-changing alarming rates, throw our trash into the oceans, spill oil, spread pesticides and herbicides and avicides, kill more than 400 million animals by automobile every year and probably the same or more through recreational hunting, and up to a billion birds by our high rises and windows. It just seems audacious for humans to isolate one or another species without finding much larger ways to correct the most serious cause of global extinction … which is us. Ingrid, when I watched the documentary “Life After People” with David Brin as leading narrator and scientist; it took me by no surprise. Humankind ‘may’ have been a biological accident (or occurrence), as he alludes at the end of the documentary. Time will be forgotten (as Brin himself alludes), as only humans have created calendars and the concept of time. Time has always been here and will continue to be, regardless of human interpretation. The earth will continue to evolve, regardless of humans. Has anyone thought that humans are not the only apex predators on earth, that ‘change’, or ‘evolution’ can also behave like a predator? 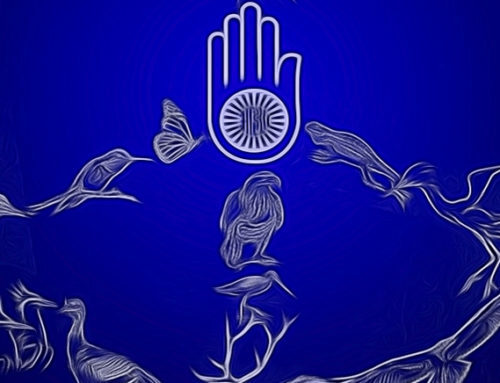 Regardless of what ‘evolution’, or ‘change’ means; I believe it governs humans; not vice versa. And I believe this to be a good thing. Ron, most of the people I’ve photographed and some I’ve worked with in a wildlife settings feel the same way you do. 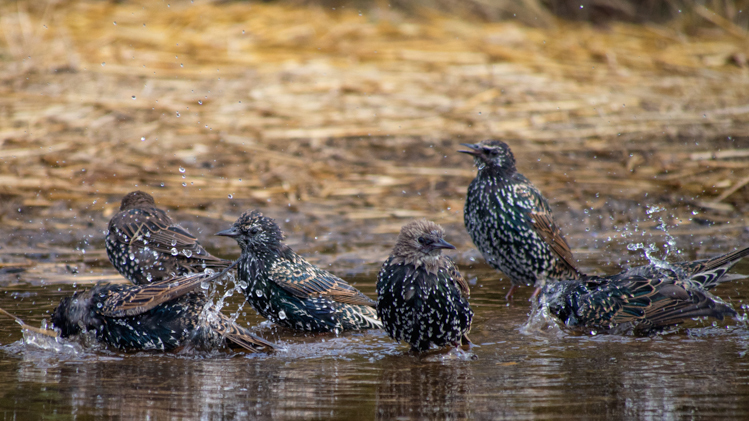 That is probably why my posts contain the usual disclaimers … because I understand the reasons why some people don’t like Starlings or their presence here. I — for better and worse — was born without the gene that allows me to remain 100 percent objective. I see injustice in the equation — witnessing, for instance, the very cold-blooded ways in which non-native species are sometimes treated by humans because of that designation, even if in those situations they are causing little or no harm. So, my approach is clearly filtered through personal experience and also, admittedly, through the heart. With words and images you out-do yourself every time Ingrid! 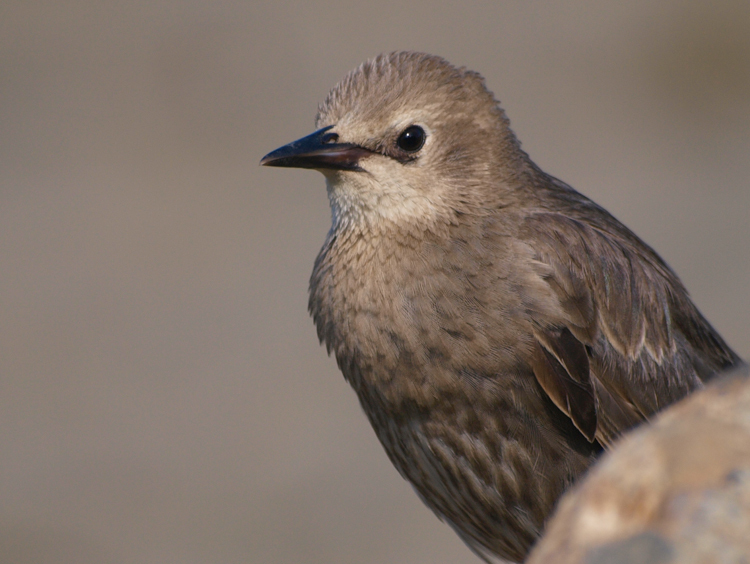 Never knew young starlings had spots… Sadly I knew they’re under terrible and hurtful discrimination. Whistles, chants, murmurs and twitters to you for chirping on their behalf!